Jennifer and I attended a meet and greet for the Canadian Forces Snowbirds last night at the Penticton Lakeside Resort Convention Centre & Casino. Snowbirds Commanding Officer Major Robert Mitchell and Public Affairs Officer Captain Jennifer Jones presented commemorative posters to Peachfest organizers and Penticton dignitaries including Mayor Jake Kimberly. The team was also on hand for photo ops and autographs. I tried to get the lowdown on plans for replacing the CT-114 Tutor jet which has been used by the Snowbirds demonstration team since 1971, but no one was ‘fessing up. That said, the boys will open Penticton’s Peach Festival 2008 put at 6PM tonite by putting on a fantastic show in their Tutors. The showline is set at just 450 metres off the south shore of Okanagan Lake with Center showline at the Kiwanis pier. Best viewing will be in Okanagan Lake Park close to the pier. It promised to be an excellent performance considering the “tight” show box in which they have to perform. Thanks for visiting – and hope it won’t be 8 more long years before the Snowbirds come back to Penticton!! More pics from the Snowbirds meet and gredt here — and more to come from Peachfest events! I first saw the Snowbirds perform in August of 1978 at Abbosford B.C.. They give a spectacular performance which I think is better than the Thunderbirds or Blue Angels because the Snowbirds do everything with more airplanes. Personally, I like the Tutors because they keep the show slow and in front of the crowd. 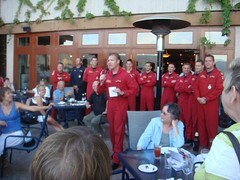 In summary, if you have a chance the see the Snowbirds, don”t pass it up!